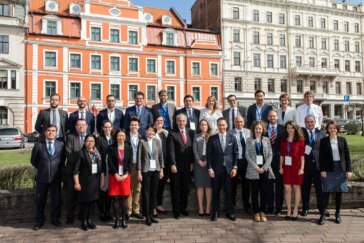 On 17-19 April 2018, the first Networking Conference and Review Workshop of the project “SEnECA – Strengthening and Energizing EU-Central Asia Relations” of which our institute is the Co-Leader took place in Riga. Organized by the Latvian Institute of International Affairs (LIIA), the conference provided an opportunity for the consortium partners to meet in person, to discuss their work progress and to widen their networks. The project SEnECA has the aim to strengthen the relationship between the EU and Central Asia by building a new, sustainable and transdisciplinary stakeholder network. In the long run, the project aims to integrate researchers from Europe and Central Asia, political decision-makers and stakeholders and enable sustainable cooperation between them. Our institute took over several roles at the conference and sent a three-member delegation. Dr. Katrin Böttger, deputy director of the IEP and policy advice coordinator at the SEnECA project welcomed the guests and introduced them to the SEnECA project. She also moderated the panel on the analysis of networks of Central Asian researchers. Research Associate Julian Plottka introduced the panel which analyzed the density of links between certain subgroups of researchers within the network, such as citation circles, as well as areas where links are more loose. Another highlight of the conference was the exclusive round table with the EU Special Representative for Central Asia, Peter Burian, the SEnECA consortium and SEnECA Advisory Board members. In this first encounter, the Special Representative provided valuable insights into the ongoing revision process of the EU Central Asia Strategy and emphasized that evidence-based research such as the SEnECA recommendation papers and the long-term Central Asia Communication Strategy will be able to provide substantial input to the review process. Moreover, Burian pointed out that consultations with the Central Asian partners have already taken place in Tashkent and other capitals and that several thematic working groups have been set up (e.g. one on designing tools to boost investment in Central Asia while being attentive to the environment). The Advisory Board members, for whom the Riga conference was their first SEnECA event, could share their opinions with the ambassador and get a feeling for the overall relevance of the project. A public high-level panel discussion on the status and prospects of the cooperation between the EU and Central Asian countries took place at the Latvian Ministry of Foreign Affairs on the second day of the conference. Next to Peter Burian, the panel included the Latvian State Secretary of the Ministry of Foreign Affairs, Andrejs Pildegoviĉs , the Director of LIIA, Dr. Andris Spruds (who chaired the debate), the Director of the Central Asian Studies Center at KIMEP University, Dr. Nargis Kassenova (Kazakhstan), the Head of the Contemporary History and International Relations Department at the National University of Uzbekistan, Dr. Mirzokhid Rakhimov, and the Co-Lead of SEnECA and Professor for European Integration and European Union Politics at the Department of Political Science of the University of Duisburg-Essen, Prof. Dr. Michael Kaeding (Germany). During the high-level panel discussion, the following crucial areas for cooperation could be identified: connectivity, environmental policy, education and civil society, economic relations as well as the rule of law and good governance. The panelists agreed that the revised EU Central Asia Strategy, which will be finalized by summer 2019, should be more focused than the existing document, taking the needs of Central Asian countries more into consideration. The idea that the EU should especially focus on areas in which it has a long-standing expertise and can add real value to Central Asian societies (i.e. vocational training, environmental standards, technological expertise, experience with involving civil society into decision-making processes etc.) was quite prominent in the debate. The internal consortium meetings of the conference dealt especially with the mapping papers that are jointly produced by all consortium members. These incorporate the political, economic and cultural dimension of Central Asian-EU relations within the timeframe from 2007 until today. The mapping papers constitute the basis for the analysis and recommendation papers that will follow. In addition to the papers, the stakeholder analysis and the network analysis were key topics in the consortium meetings. Both analyses will result in a joint database, which will help scholars finding research partners, identifying relevant policy-makers or media representatives and enlarging their professional networks. Overall, the conference in Riga allowed SEnECA partners to form closer relations with each other and to simultaneously enjoy the Latvian cuisine, architecture and hospitality. The conference provided room for conversations on common research projects, current political developments, cultural commonalities and differences, gender issues, food habits and other topics. These encounters are crucial to a project that seeks to energize the relations between two regions which have already started creating closer ties since the end of the Cold War and are on the best way to deepen them even more in the future. Riga was the second gathering of the SEnECA consortium after the project kick-off in Berlin in January 2018. In Berlin, partners met for the first time to become acquainted with Horizon 2020 procedures, to set the course for the two years project and to get to know each other better. The agenda of the Riga conference can be viewed here.